Stop the GM Closure! Stop NAFTA 2.0! General Motors announcement that it will close the Oshawa car plant is a declaration of war on Canadian autoworkers and on automobile manufacturing in Canada. The Big Three automakers will use the new NAFTA 2.0 agreement to shift their plants south to Mexico where wages are $4 an hour or less – a fraction of what workers in Canada are paid. This is what GM is doing with its Oshawa plant, despite the fact that this plant has won international awards for its quality and productivity repeatedly. This US transnational corporation is pulling up stakes because it can. Because the Canadian and Ontario governments won’t lift a finger to stop it. Because GM’s greed knows no bounds and it’s quite willing to super-exploit workers in Mexico who will never be able to buy the cars they make, while abandoning workers in Canada who have created the enormous wealth and profits that GM has ferried out of Oshawa since 1918 and since 1953 in this particular plant. The Auto Pact protected auto jobs in Canada for over 35 years until the World Trade Organization struck it down in 2001. Capitalist globalization, aided and abetted by the Canada-US Free Trade Agreement was responsible for suddenly making auto plants and jobs completely mobile – transferable to whatever jurisdiction provided the lowest wages, the biggest incentives, and the lowest corporate taxes. And all with the blessing of federal and provincial governments. Now the USMCA – or NAFTA 2.0 – is an open door to tip all auto manufacturing out of Canada, just as NAFTA cleared auto production out of Quebec a generation ago. Today it’s GM destroying the livelihoods and lives of 2,800 autoworkers and their families in Oshawa. Tomorrow it might be St. Catharines or Ingersoll. Or it could be Ford or Chrysler closing up in Windsor, or Oakville, or Brampton. Or parts plants in Southern Ontario. There’s no limit to what these greedy corporations will do if they’re not stopped in their tracks. It’s time to stop the clock on these transnational corporations. The federal government must be forced by the united action of labour and its social, political and community allies, to stop the closure of the Oshawa plant, and stop this race to the bottom facilitated by corporate migrations to the low-waged, non-union, continental south. Militant workplace actions combined with mass, united independent political action led by Unifor, its sister unions in the CLC, and its community allies can turn the tables on GM and force them back. The Communist Party demands federal and provincial governments intervene to stop the closure now, or failing that, to nationalize GM’s operations in Canada, transform it into a crown corporation under public ownership and democratic control. A publicly owned corporation could produce a Canadian car that’s environmentally sustainable and affordable, as part of a public transportation policy that meets the needs of the Canadian public and provides good, value-added manufacturing jobs for workers. 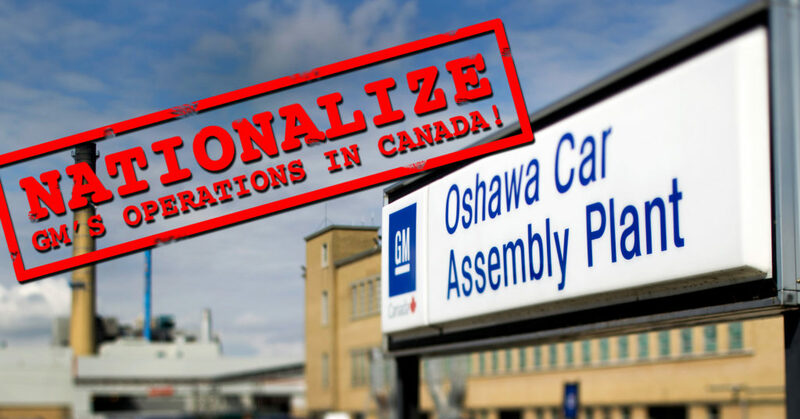 The massive concessions forced on autoworkers in the wake of the 2008 economic meltdown, combined with massive tax breaks from the federal and provincial governments, mean nationalization of GM’s Canadian operations should be without any corporate compensation. Further we call on the government and Parliament to renounce the USMCA agreement and refuse to ratify the deal that will cause more closures and more misery for workers in Canada, the US and Mexico. We also call for plant closure legislation with teeth that will force corporations to show just cause before public tribunals with the power to stop closures, and jail corporate executives. The Communist Party stands with Unifor Local 222 workers who downed tools and walked off the job in the first protests against GM’s closure announcement. The fight for GM workers is the fight for all workers in the auto sector, including auto parts and assembly, and for all those thousands of workers in spin-off jobs whose livelihoods depend on auto plants and production in Canada. It’s a fight for sovereignty and independence that the federal government must take up or step aside to make room for a new government that will act to protect workers’ jobs, manufacturing, and the public interest in Canada. GM’s greed and thirst for more and more profits at the expense of Canadian autoworkers and the Canadian economy demands decisive action from the federal and provincial governments to stop this corporation in its tracks.